These pages tell you about the research done by the solar group at Tuorla Observatory and Space Research Laboratory, University of Turku. We present our main research topics, instruments, and collaborators around the world. Why do we study solar flares? What are coronal mass ejections? And how do they influence us? 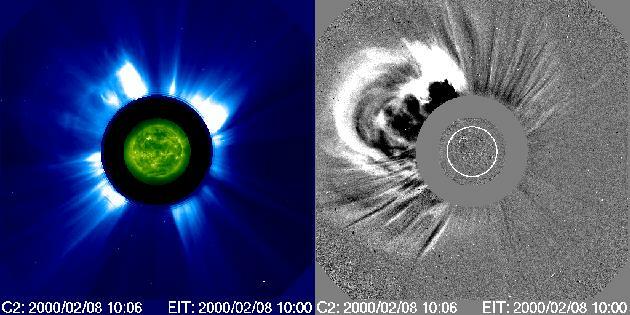 Composite image of the coronal mass ejection (CME) observed on February 8, 2000 by SOHO LASCO and SOHO EIT. Difference image on the right shows the ejected material in detail. The average velocity of the ejected mass was estimated to be around 1100 km/s. This CME and the associated events and features were analysed at Tuorla, in collaboration with solar researchers in Meudon, Glasgow, and Athens. The CME catalogue is maintained by NASA and the Catholic University of America in cooperation with the Naval Research Laboratory. SOHO is a project of international cooperation between ESA and NASA.